Fans on both sides of the world are excited about two upcoming fan events. First up in Sydney Australia on Saturday August 3rd is NON-STOP ABBA!, at the Imperial Hotel in Erskineville. Sharp-eyed fans may recognise the name of the venue – the opening and closing scenes of the movie The Adventures of Priscilla, Queen of the Desert were set and filmed there. Everyone is welcome. Tickets are $10, available at the door on the night. A week later in London, England on Saturday August 10th is ABBAdance, at The Hop Poles in Hammersmith. Even clueier fans may recognise that this venue is opposite the Lyric Theatre, home of the musical ABBACADABRA! A musical adventure at Christmastime, 1983. Tickets are £7.50 and must be prebooked here. Both events promise a night of ABBA music, the chance to meet other ABBA fans, and a lot of fun. If you can make it to either event (or both! ), you should – you won’t be disappointed. In the year of the fortieth anniversary of its release, ABBA’s debut album Ring Ring is getting the deluxe treatment. Ring Ring Deluxe Edition features the 12 tracks from the original international version of the album, plus the Swedish, German and Spanish versions of the title track, non-album B sides, and a DVD of previously unreleased television performances, including a fascinating look at the recording of ‘Ring Ring’, in which Benny plays various elements of the songs mastertape, showing how the pieces of the song came together. Uniquely it also includes six pre-ABBA recordings, four of which are sung by other artists. These include early versions of two songs from the Ring Ring album, and other songs that demonstrate the coming together of the four to become ABBA. All the extra bonus tracks bar one were written by Benny and Bjorn, and clearly feature the backing vocals of future ABBA members. Some of the songs are making their CD debut. Fans everywhere have been discussing the release at length since the announcement on June 27th. The most common comments are the exclusion of the B side of the Swedish ‘Ring Ring’ single ‘Åh, vilka tider’ (it was vetoed by Benny and Bjorn), the inclusion of the pre-ABBA song ‘She’s My Kind Of Girl’ (it was the B side of the English version of ‘Ring Ring’ in Scandinavia, and replaced the Swedish version of ‘Ring Ring’ on the album on all international releases of the album), the inclusion of songs by other artists, and the exclusion from the DVD of some known television appearances of the time (sometimes footage is not available, or it is not cost effective to include it). 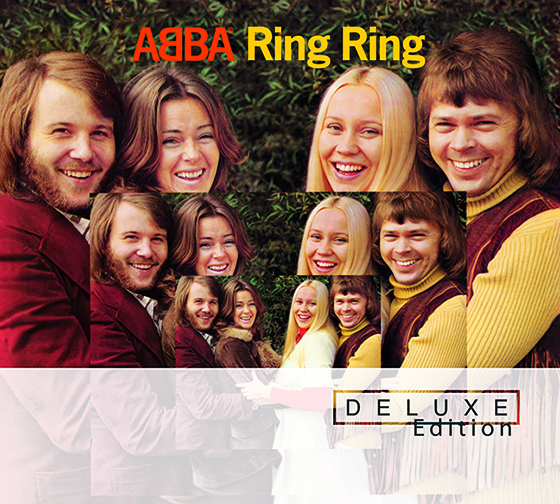 Ring Ring Deluxe Edition will be released on October 4 2013, and is the seventh ABBA Deluxe Edition (eight, if you include 2004’s Waterloo 30th Anniversary Edition).